Come See the Natural History Museum of Utah! While Salt Lake City has a number of historical and educational sites, none are more interesting and entertaining than the Natural History Museum of Utah. Located along the foothills of the Wasatch Front, the building has been a source of entertainment and education since 2011. 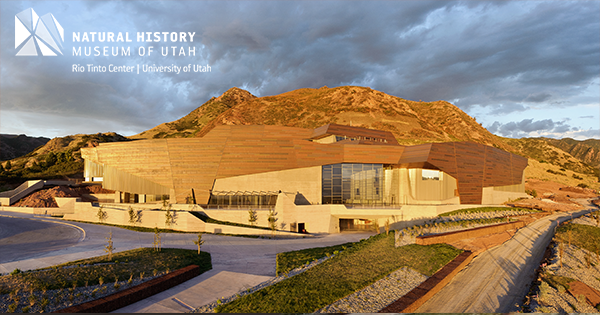 Housing a multitude of exhibits, artifacts, and specimens the museum offers anyone visiting Salt Lake an opportunity to spend a day learning about the various elements and forces that have helped shape this beautiful area. The Natural History Museum of Utah offers a variety of exhibits that are sure to astound guests of any age. Some of these exhibits include Native Voices and First Peoples. These displays offer a look at what life in Utah was like before westernization, and what life for Utah’s indigenous people is like now. Anyone who loves looking at american history through the lens of those here before its establishment are sure to love this exhibit, and learn more about the way Utah helped shape federal policy regarding indigenous people. Another aspect that the NHMU dives into is Utah’s ever changing geography, and the tectonic and atmospheric elements that work in tandem to do so. This is described in amazing detail and clarity in the Sky and Land exhibits. In Land, visitors can learn about the various changes that Utah’s face has undergone in the previous centuries, how these changes shaped the region to appear as it does, and see how tectonics helped create the beautiful state Salt Lake City is housed in. in Sky, guests can look at how the atmosphere generates the weather patterns that erode the geography into the breathtaking landscape that is found here. Sky also offers an in depth analysis of how climate change has been a part of Earth’s history, and how the future looks regarding it. Perhaps the most renowned and recognized part of the NHMU is its exhibit containing an immaculate display of dinosaurs, prehistoric mammals, and fossils known as Past Worlds. Here any visitor can travel back in time to find over 100 displays and specimens spanning multiple centuries of our planet’s living history. With specimens such as Utahraptor, Allosaurus, Brontosaurus, and the world’s largest display of horned dinosaurs, people of all ages are sure to be enchanted and enthralled by this immersive exhibit. Guests can dig for dinosaur bones at an in house archaeological dig site, cast their vote in the great Cleveland Lloyd mystery, and view paleontologists assemble fossils right before their eyes! If that wasn’t enough, there are also opportunities to speak with actual researchers and scientists about their discoveries, such as a new species of Tyrannosaur. For guests that are into architecture and building design, the NHMU is a perfect fit as well. Constructed to flow seamlessly from one exhibit to another, the planning and design of this building is a beautiful example of modern construction. The building was also constructed with over one thousand solar panels atop to aid in the transition to green energy, and is coated externally with copper sourced from local mines. While some say that copper on the exterior is an interesting choice, it actually was done in order to oxidize and turn green in order to match the color of the foothills that it is nestled into. 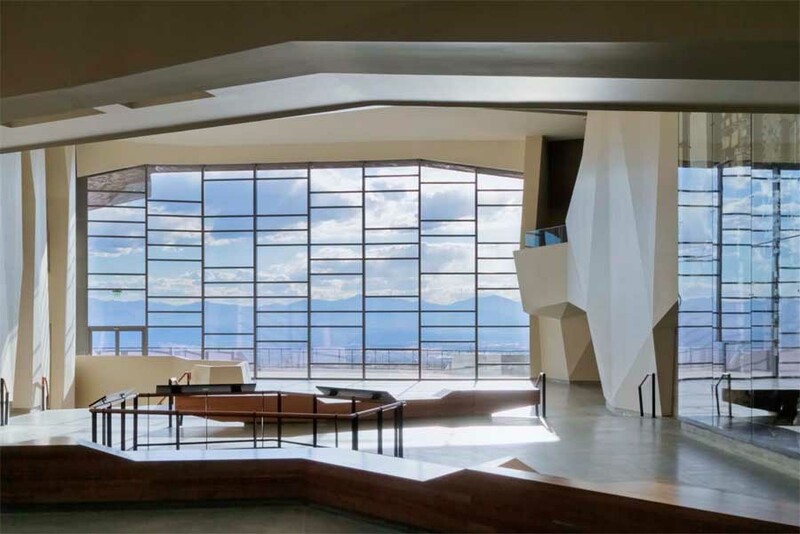 The building also has a gorgeous glass wall that offers an incredible view of the Salt Lake Valley and Oquirrah Mountains opposite the Wasatch. With so many activities one has to wonder how they will be able to do it all on any other tour group. Well with US Bus you can hop on and hop off right at the entrance of the museum, and stay as long as you desire! With buses coming by every forty five minutes, you can get your fill of dinos and discovery and then continue on to see the rest of the historical beauty that Salt Lake City has to offer.Be sure to check out the links below detailing the museum and a review done on it by the New York Times!